So cute! 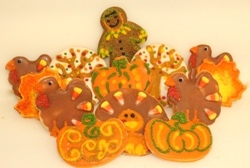 An assortment of Turkeys,pumpkins and fall trees to decorate your holiday table. Both kids and adults will be fighting over these cookies.